Deep Fried Turkey, I have to tell you when I saw them pull this bird out of the fryer, all I can think of was the Griswald Family Christmas Turkey from Christmas Vacation movie! I was so scared with no back up plan! I was absolutely amazed how the juices ran out of this bird, and the smell of the marinade was mouth watering, buttery, juicy and believe me, it didn't last long! I was a newbee to the fried turkey world. A southern tradition I was not accustomed to at all. We always slow roast our turkey overnight and wake up to the aroma in the house on Thanksgiving morning. Since this year I had to work and couldn't cook, this idea turned out to be a fantastic alternative for sure! Curt was checking to see if it was done, 14 pounds in 45 minutes, the fryer was set on 350 F degrees, he heat the oil first around 30 minutes before dropping this bad boy inside the peanut oil. Curt kept his eye on the heat setting making sure it stayed a constant 350 degrees. After watching several food stations on the best methods, my husband bought a rope, used around a 12ft ladder and hang the rope over the top step through the middle of the ladder.He tied the rope to the hook that was furnished by the fryer and attached it tightly to that hook. This allowed them to lower the basket (also part of the fryer) to lower this safely into the oil. Lower this very carefully as the oil can spill over, splash and can be very dangerous, never ever use a frozen Turkey there is way to much ice and water in it, the splash could be very dangerous. We used a fresh Turkey and took it out of the refrigerator for around 1/2 hour while waiting for the oil to heat to 350F degrees. Preparation is very important getting the oil heated to 350F degrees, if it's not hot enough oil the turkey will be greasy and not cook evenly. Slowly lower the turkey into the oil. Very slow. I was a wreck worried we would need a back up plan, boy was I wrong! My husband was so sure of himself and confident he was going to Ace this one! I should have had more faith in him! Since this was his first time, I felt lost not being in the kitchen this year and allowing them to both take over for the holiday.... After this experience, I am loving it! I know fried foods aren't healthy! But this was our first time trying out fried turkey.. and wow, was I impressed. This was juicy, flavorful, and like a huge chicken wing ....only thing missing was hot sauce ( smile). Of course, everything in moderation, I wouldn't eat this amazing bird everyday but I have to tell you, it was nothing like I expected. I thought it would be greasy and flavorless. However, after talking to several fried turkey lovers, I found out that the best way to prepare this was injection, marinading for three days, then deep fried perfection is in your future. Just an amazing taste! In a food processor place 3 minced cloves of garlic, 1 teaspoon peanut oil or sesame oil, olive oil, butter, soy sauce and paprika. When butter has melted. This mixture is used to inject the turkey before frying. Two ounces per pound of turkey. Inject the turkey about 5 inches apart, having the injector go in different directions several times for each hole made. the turkey. If there is a removeable pop-up timer in your turkey take it out and throw it away. I use a roasting disposable pan to place the turkey with marinade injection in and refrigerate overnight, up to two days if you want too, you can also use a large bag as well. Thirty minutes before cooking, remove the turkey from the refrigerator and let sit at room temperature. Bring the oil temperature to 350F degrees. Pat the turkey dry with a clean towel. Put the turkey in the frying basket, breast side (neck end) facing down. With a hot mitt covered hand, stand away from the oil using the method above and carefully lower the turkey into the cooker. Allow the oil temperature to stay consistant heat at 350F and continue frying, allowing 3 1/2 minutes per pound this is what was recommended. Our 14 pound Turkey took 45 minutes to cook. Pout the peanut oil to the line on the inside of the Turkey fryer (check your instructions guide) Make sure there is no ice or water inside the Turkey if using frozen for safety of exploding splatter of oil will occur. The turkey will turn a deep brown when done and will be crisp. The temperature in the thickest portion of a thigh should read 175 F using a meat thermometer. Remove Turkey to a clean large pan. Then allow to cool a few minutes before slicing. They ate this bird so fast I have never had a whole Turkey eaten that fast! I don't think my son wanted to give up this beautiful turkey, he got crazy eyes while slicing it (smile)! Great job to you both for making this awesome Turkey! They all devoured this whole bird, no leftovers! 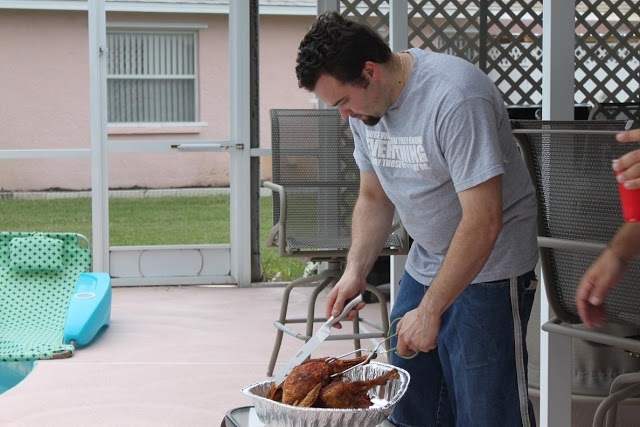 Hope you got some tips on how to make this great fried turkey. It's a definite make again recipe! Try it at least once you won't be sorry! Thank's to my two great Iron Chefs for my wonderful Thanksgiving Day Turkey dinner! Happy Thanksgiving 2010, a very memorable one for me, as I didn't have to cook this year!!!!! Off to sleep, Black Friday is among us, and I have to be to work at 1:30 am and that's right now 4 1/2 hours from now...goodnight have at least a 15 hour work day tomorrow, hope your family had a wonderful holiday! That does look very succulent! I never did a fried turkey myself either, but it looks so fun. They really went to town! What a creation. Glad y'all ate well! I never saw the process of a frying a turkey before, I think it's a great alternative, with gravy and stuffing I sure it was delicious. Thanks for the tips. Congrats to your husband and son. We've got our "back up" turkey in the freezer and I froze a big pan of stuffing last night. We'll be frying that one in about 2 weeks when we're ready for more turkey. The last one we did was succulent. I never used the injector that came with the fryer, but you've made me want to try it. I've never had a fried turkey, but it really looks so moist! I'm glad it all turned out well, and I'm loving that contraption they built to lower the turkey into the oil, smart but also funny, haha. Better safe than sorry! Happy Thanksgiving Claudia! We just decided yesterday that we're doing a deep fried turkey next year. Going to buy the son-in-law a deep fry rig for Christmas. I was worried about the splattering and just LOVE the ladder idea. I will insist the guys do it that way. As always, I can count on you for inspiration! I really want to try fried turkey - it looks amazing - so tender and succulent! I love fried turkey. It tastes so much better than roasted turkey. Yummy! Wow! The whole set-up is very impressive. One day I'll have a deep fried turkey... one day! Hope you had a great holiday! We did this one year and I was a total skeptic. I was sure it would be greasey and gross, frankly. It turned out to be one of the most succulent turkey's we've every had! Glad you are spreading the word! Claudia-Your husband and son deserve a huge applause!!! Not easy frying turkey, especially the home style method. I did have deep fried turkey a few years ago...our friend bought the fryer, and only used it once...too bad, because it is so juicy, tender inside, and crispy on the outside, and not greasy, at all. Thanks for sharing your yummy, and beautiful turkey, along with the fabulous photos, as well! Never seen the ladder technique, but it does look much safer. And having it all away from the house is a huge safety plus. Deep fried turkey is the best!